The NOOK Tablet has many note taking tools to make your reading experience as good as or better than that of reading a hard copy of a book. An electronic bookmark works just like a piece of cardboard between pages: It allows you to quickly open to a particular page. You can set as many bookmarks as you like in each book. Set a bookmark on the page you’re currently reading. Tap in the upper-right corner of the page. A small aqua blue ribbon will appear in the corner of the page. Tap the center of the page to open the reading tools. Tap the Bookmarks tab (in the Content pane). The tablet will list all the bookmarks in the book. Tap a bookmark in the list to jump directly to the passage or page. Close the bookmark list without visiting a bookmark. Tap anywhere on the book page outside the list of bookmarks. Remove a bookmark on the current page. Tap the blue ribbon in the upper-right corner of the page to make it go away. 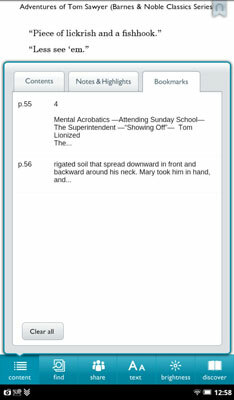 Tap the Content icon in the reading tools. Tap the Clear All button. The bookmarks even let you enter a few notes to help remind you of what caught your attention. What exactly is a battologist? If you come across a weird word, look it up in the built-in copy of the Merriam-Webster’s Collegiate Dictionary, Eleventh Edition. 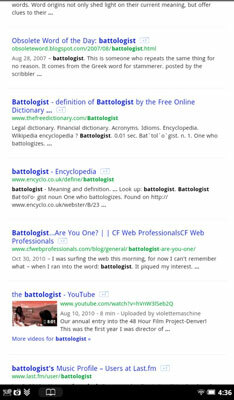 But if that dictionary can’t help you answer the question, “What exactly is a battologist?”, then go out on the web to consult other resources. What exactly is a battologist? Someone who unnecessarily repeats something. You can share a word (like you-know-what), or pick up a short passage and send it by e-mail (or Twitter or in a Facebook post). The NOOK Tablet is ready, willing, and able to assist. To expand the highlight from a single word to a passage, tap and then drag one of the vertical bars. When you lift your finger or fingers (you can use your thumb and pointing finger to cover more area), the Text Selection toolbar appears. You can’t directly print a passage from your NOOK Tablet (at least not in the initial release), but here’s what you can do: Select a passage and send it to yourself by e-mail. Then use a computer and printer to make a hard copy. Be sure you understand the proper use of citations if you are using part of a copyrighted book in an academic paper or a publication of your own.